Why your Best Mutual Fund Schemes may not remain as 'THE BEST'? We always want the best in our lives and we always like to give the best to our beloved ones. It is applicable to personal life as well as personal finances. We would like to invest in the best mutual fund schemes, best real estate property, best bank fixed deposit, safest investment option, best Demat Account, best life insurance scheme, best health insurance scheme and the list goes on…. Whether you are an Advisor or an investor, the important parameters to shortlist the top performing mutual funds are ‘past performance’ of the MF schemes (returns) and also the data related to ‘risk ratios’. What if there is a case where past performance may become irrelevant? What if your Funds’ investment strategy and objective itself change? Or your Funds’ portfolio allocation undergoes a sea change?? All these changes are happening due to SEBI’s recent guidelines on ‘Mutual Fund re-categorization’. To meet these new guidelines all the mutual fund houses may have to merge, modify or close their available schemes. This is the main reason that I am yet to publish the ‘Best Equity Mutual Funds 2018’ article. How & Where to find the information related to proposed Fundamental changes to Mutual Funds? Whether you are an existing investor or a new investor, suggest you to kindly visit the respective fund house websites and access the link related to Notices/Downloads/Addendum section to get information on ‘MF re-categorization’. HDFC Mutual Funds Website -> Downloads -> Notices -> Kindly click on ‘Notices’ like ‘Notice for Change in Fundamental Attributes of Select Equity & Hybrid Schemes’. DSP Balckrock AMC -> Quicklinks -> Downloads -> Notices & Addendums. 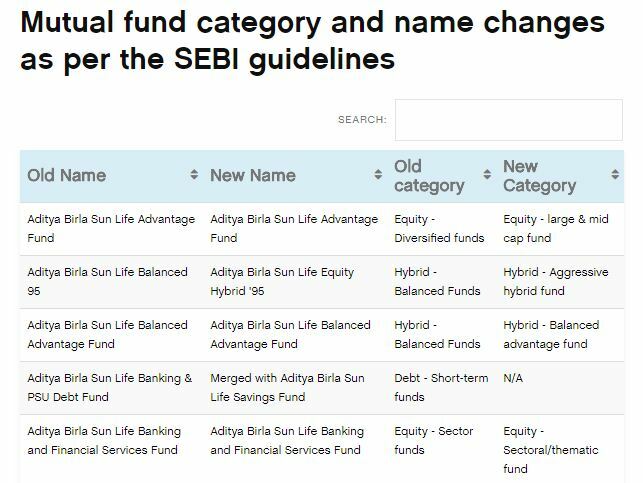 Change in MF Scheme name : All the fund houses have been re-naming most of the existing MF schemes to meet the norms laid down by the SEBI. In case, only the name has been changed and there has been no change in the fundamental attributes of a scheme then there is nothing much to worry about! Change in Investment Objective : Under this scenario, chances are there that the name of the Scheme and its investment objective are going to change. For example : Aditya Birla Sun Life Small & Midcap Fund is going to be re-named as Aditya Birla Sun Life Small Cap Fund. The Fund’s current investment objective is – “The Scheme seeks to generate consistent long-term capital appreciation by investing predominantly in equity and equity related securities of companies considered to be small and mid-cap. The Scheme may also invest a certain portion of its corpus in fixed income securities including money market instruments, in order to meet liquidity requirements from time to time. Fundamental Change in Investment Strategy : Besides a change in name of the scheme, there can be a change in proposed investment objective and strategy as well. For example : SBI Emerging Businesses Fund is going to be renamed as SBI Focused Equity Fund. It is going to be a n open-ended Equity Scheme investing in maximum 30 stocks across multicap space. Change in Fund’s Portfolio Asset Allocation : There can be a change in the way the fund’s corpus is being allocated across different Financial Instruments and Asset classes. Merger of two or more Schemes : If you have invested in a fund and it is going to be merged into another similar fund then you need to analyze the investment objectives and strategy of the ‘surviving scheme’ and take investment decision accordingly. Another example is – UTI Bluechip Flexi-cap Fund is going to be merged into UTI Equity Fund. Change of Fund category or investment theme : If this is being proposed then it is a very big change to watch out for! There will be a change of Fund name, type of Scheme, fund category, portfolio allocation etc., In this scenario, you need to analyze the proposed features of the scheme and if it does not match your investment objective(s) and risk profile, you may have to come out of it and re-look at your investment portfolio. For example : SBI Magnum Equity Fund is going to be renamed as ‘SBI Magnum Equity ESG Fund’. It is being proposed to be positioned as a Thematic fund from its current large-cap oriented fund. The Fund is going to invest in diversified basket of companies following Environmental, Social and Governance (ESG) criteria only. So, obviously there will be a change in its benchmark index as well. Almost all the fund houses have mentioned that these proposed changes are to be effective from 3rd or 4th week of May, 2018. During this period, you as an investor can take a decision to remain invested in the schemes, switch-out from the schemes or redeem your exiting Scheme units. As per the amendments, allotment of units in Surviving Scheme, pursuant to merger, to Unit holders of Merging Scheme who decide to continue will not be considered as redemption of Units in Merging Scheme and will not result in short term / long term capital gain / loss in the hands of the unit holders. So, there won’t be any tax implications. However redemption of units from Merging Scheme and/or switch-out of units of Merging Scheme to any other schemes of the Fund during exit window shall be considered as redemption in Merging Scheme and will result in short term / long term capital gain / loss in the hands of the Unit holders depending on the period of holding of the investment. Hence, taxes on capital gains (if any) are applicable. Switch out : In case you decide to switch from one fund to another fund during the prescribed period then transactions are treated as normal redemptions and capital gains (if any) can be subject to taxes. There are thousands of MF schemes to choose from. It is pretty confusing and challenging for an investor or advisor to shortlist right set of mutual funds for investments. There are multiple schemes with same investment objectives, strategies and portfolio allocation within the same Fund house. The SEBI’s new norms will de-clutter the offerings. It will ensure to cut-down the number of available schemes across different fund categories. 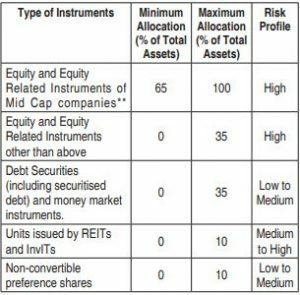 The SEBI might be proposing a well stated ‘templates’ for portfolio allocation which may limit the number of choices or opportunities for a fund manager to pick from. But, let’s presume that good fund managers will do good in any regulatory environment. If there are any changes in objective and strategy of a Fund, then past performance may become irrelevant. We may have to consider it as whole new fund with new benchmark and new set of Peers for making a comparison. It takes time to get the relevant Data (returns and risk data) to make a comparison among the Funds within the same category and also the funds with respective benchmarks and so on…. If you are an existing investor, do not panic if you see poor performance (or indifferent performance) being reported by your fund in the near future, be patient! If you have invested in a fund and if there are any minor changes being proposed, you may better off remaining invested and keep a track of its performance for next couple of years. HDFC Top 200 Fund is going to be renamed as HDFC Top 100 Fund. It has always been a Large-cap oriented fund. The only difference now is – the fund currently invests primarily in top 200 companies by market capitalization. It is now being proposed to invest in Top 100 companies by market capitalization. Event though there is a change portfolio allocation, the investment strategy is more or less the same. SBI Magnum Balanced Fund is going to be renamed as ‘SBI Equity Hybrid Fund’ with almost same investment objectives and strategy. Aditya Birla Sun Life MIPII – Wealth 25 Plan is going to be renamed as Aditya Birla Sun Life Regular Savings Fund with similar investment objective, strategy and portfolio allocation. In case, there is a total change of investment theme of a fund and if it does not match your investment objectives then you may consider moving out of such schemes from your portfolio. If you are a new investor looking to shortlist a few right and best mutual funds or an existing investor who wants to add some more funds to your portfolio, kindly do not go by the Star ratings given in MF research portals (or) do not go by the ‘best mutual funds list’ available on various online platforms blindly (including my blog). This can be even more a challenging task in case of ‘Debt Funds’. If you would like to invest a portion of your investible surplus in Debt funds then you may keep it simple and short by investing in Liquid and/or Ultra Short Term Debt funds (for short and medium term goals). You may pick Dynamic Debt funds for your long-term goals. Whether you are an advisor or investor, you now need to put lot of efforts and do deeper research to pick best mutual funds. Things are not going to be easy to select top performing mutual funds with very less past data being available. Are there any Investment Options which are really THE BEST? I have been investing in “Franklin India High Growth Companies Fund – Direct Growth” via SIP mode since around last two years. My investment horizon is 11 years from now(13 years when started two years back). Recently the performance of this fund has gone down considerably. I know there will be ups and down in the fund performance and this fund has very good and long track record so I was not really worried initially. But this fund continues to perform not so good compared to category and peers for longer time now. The recent investments are actually in negative returns. Also the market overall has not done bad in this period. So I am thinking should I stop further SIP installments and look for alternative or continue with this fund for some more time and then decide later. Your views on this, please. I am doing good, thank you! Hope the same with you! After the recent SEBI reclassification, a lot of changes have been proposed across MF schemes. Though the investment objective of FHGC is almost the same, the investment strategy/type will be more focused henceforth. The fund can now invest max in 30 stocks. There can be few alignments happening with the fund. Suggest you to remain patient and keep a track of its performance for next 1 year or so and then take the decision (to hold or switch). I have invested in Kotak select focus fund direct growth rs 10000 since 2013. You may kindly continue with your investments in this fund. Kotak select focus fund has been re-named as ‘Kotak Standard Multicap Fund’. Hi, I am investing 5000 per month in EACH of these four funds. What do you think of them? Thank you. 2,3 & 4 funds are large-cap oriented funds. Advisable to keep one large cap fund and can diversify your portfolio further, by picking one balanced fund and one mid-cap fund instead. I am investing HDFC Prudence fund with monthly SIP 5000/~ . Current cost of Investment is 1,50,000/~ and current value is 1,71,000/~. Now HDFC Prudence will be HDFC Balanced Advantage Fund effective w.e.f June 1, 2018. As a layman – should I panic or just keep investing on the new HDFC Balanced Advantage Fund. Please guide me. I have chosen HDFC Prudence fund for long term investment with 7+yeras time span. Should I took my money from Prudence and invest it – HDFC Balanced Fund(HDFC Hybrid Equity Fund) and continue the same SIP of 5000/~? In case, your requirement is to keep investing in a true aggressive balanced fund then you may switch to HDFC Balanced fund ie HDFC Hybrid equity fund. what will be the difference – HDFC Balanced Advantage Fund vs HDFC Hybrid equity fund w.r.t long term invest ment. I have another sip 10k pm in Frak. Smaller companier fund also. Please suggest me for long term investment. One for retirements and another for chiled education. up to 100% in Debt securities. Where as, HDFC Hybrid equity fund’s portfolio allocation represents a typical balanced fund one..
As per the new guidelines – HDFC Balanced advantage fund (HDFC Prudence ) will no longer be a true balanced fund. I am using HDFC Prudence fund for long term investment with 10 + years time span for retirement planning. If I am in your position, I would prefer HDFC hybrid equity fund to HDFC Balanced adv fund. HDFC Prudence fund can be invested in 100% debt, so will it classify as a debt fund and be taxed accordingly. If the fund’s portfolio has 100% debt (but I dont think they will ivest 100% in debt, they may try to maintain it as a balanced fund) then it has to be treated as debt fund only. If one would like to invest in a true and aggressive balanced fund, may be HDFC Balanced fund (now HDFC Hybrid equity fund) can be a better choice. dear sree thanks for the article. May I expect a comprehensive article from you for new investors like us on best mutual fund? Looks like the re-classification can be completed by May 2018 by the fund houses. After which, we can have clarity on the number of schemes available in the market. Also, if there are changes done to the fundamental attributes of a scheme then we may have to consider it as good as a New Fund. In such cases, we may have to wait for few months or at least an year to measure the fund(s) performances. Will try to take a decision on this very soon, whether to post the best funds list this year or next year. HDFC Balance Fund is getting merged with HDFC Premier Multicap Fund and renamed as HDFC Hybrid equity fund. So what it becomes now an equity fund or remains as Balanced Fund only. Please clarify. Looks like we need to monitor the funds performance for next 3 to 6 months. Also does the Fund Manager gets changed as currently tow different persons manages their respective funds. Though HDFC Balanced fund is being merged into HDFC Premier Multi-cap fund, the investment objective/fund type/product labelling of Mutli-cap fund replicates that of HDFC balanced fund. Even its benchmark as well. The benchmark of multi-cap fund now is NIFTY 500 Index, after the merger it is going to be NIFTY 50 Hybrid Composite Debt 65:35 Index (which is the current benchmark index for HDFC balanced fund). Also, HDFC Premier Multi-Cap Fund has very low AUM @ Rs 295 cr only. After the merger the HDFC Balanced fund -> HDFC Premier Multicap Fund -> going to be -> HDFC Hybrid Equity Fund (which is an aggressive balanced fund). The current fund manager of HDFC balanced fund Mr. Chirag Setalvad will still be with new fund ie ‘HDFC Hybrid Equity Fund. Thanks for clarifying the doubts. Nice article Srikanth. SBI mutual funds has indicated 38 mutual fund schemes to be renamed / investment objectives that get changed, Aditya Birla Sun Life mutual funds indicated that 34 mutual funds would get affected with such change. While some fund names would get changed, if investment objective changes, investors should review and take action. Otherwise, this reclassification or categorization would only create confusion among investors. Yes, the existing MF investors have their work cut-out, need to surely review their portfolios and take appropriate action in the next few weeks. Thank you for your comment/insight! Thank you again for the analysis and the upcoming trends. What is interesting to ask is that, for new investor like me. I planned to start for the new FY. But now, it seems like its better to wait for May end until everything is bit clear. What is your opinion. Since there are 1000’s of MFs, when would there be more clarity and updated, stabilized data by major AMC’s? Waiting till May end is fine. You can spend some time to understand and analyze the re-classification of schemes during this period, as most of the AMCs have put the list of changes on their respective portals. In case, there are changes being proposed to investment strategy, objective, type of scheme and portfolio, we may have to treat them as good as NFOs (new fund offers). We can measure their performances after few years from now only. Thank you for the suggestion. I shall do the same. This is just to acknowledge the excellent article you have put up. A must-read for the investor who wants to make an informed decision in the present scenario. Dear Biju ..Thank you for your appreciation and keep visiting ReLakhs! One unfortunate part is that short-term gilt funds are gone completely. Don’t fit into any category prescribed by SEBI. Earlier, i think 1-200 were considered as largecap. Earlier, there were no clear-cut definition of fund categories. Equity Mutual Funds were generally classified as Large cap, Mid-cap (or) Small cap funds based on the size of the companies in which the fund invests and not the size of the mutual fund itself. Large Cap Mutual Funds: Large cap mutual funds invest in large cap companies i.e. companies which have market capitalization of more than Rs 200 billion (Rs 20,000 crore). One can look at the BSE-Sensex or BSE-100 Index as a reference point for large cap stocks. Market capitalization for stocks in the BSE-100 Index, for instance, ranges from Rs 200 billion to Rs 3,500 billion. 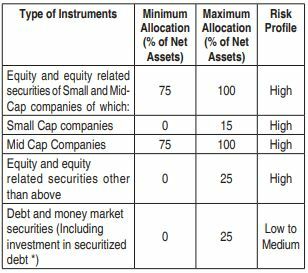 Example : HDFC Mid-cap Opportunities Fund. Example : DSP Micro-cap Fund. Now, as mentioned by you, based on what has been officially stated by SEBI, in their circular on categorization and rationalization of mutual fund schemes. Thanks Sreekanth for the fast response. Just a query – Now suppose a company having market capitalization of 200 billion but if it still ranks 101 in terms of market capitalization then large cap mf still will not be able to invest in it which was not the case earlier, right? In most of the cases, enough lee-way has been given to the Fund-managers to accommodate other cap stocks/securities (as per category) as well. For example : SBI Bluechip Fund. The new investment objective of this scheme is : To provide investors with opportunities for long-term growth in capital through an active management of investments in a diversified basket of large cap equity stocks. Earlier i was thinking Midcap MF would become less aggressive now as they have to invest min 65% in 101-250 rank companies (which was the range of large cap earlier ). But i forgot rest 35% is free for fund manager to invest anywhere. What if the FM chooses to invest 0 to 35% in small caps then the said Mid-cap fund can become an aggressive one! So, as opined by you let’s wait, track the changes/performances and TIME only will tell us….